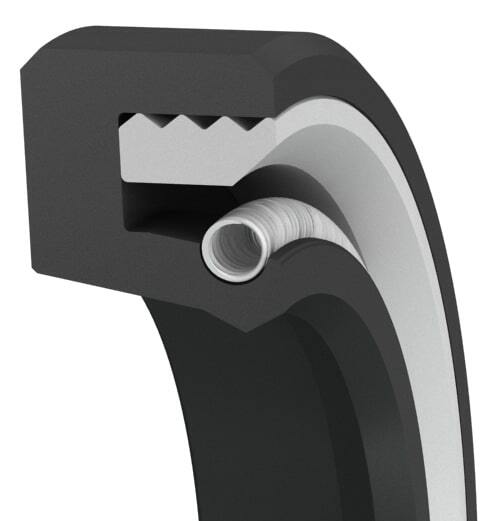 Medium-pressure single-lip oil seal for press-in fitment, retaining device required to hold seal in place under pressure. The rubber OD provides better static sealing. The thermoplastic reinforced design ensures concentric fitment and increased corrosion resistance over traditional seals. Optimized seal lip design uses a garter spring to maintain a constant radial lip load, thus ensuring optimum sealability. This seal is also available in small quantities for repairs and seal replacements within 1 to 3 days. For dirty, dusty or polluted environments, our R2HP1 style with additional dust lip should be used. Size Table (Inch)Standard sizes listed below are preferred sizes for new design applications; however, we offer any other seal size as required.Seals are available for any shaft diameter size in 0.001 inch increments, including Functional Range. Standard Range Functional Range Tolerance * D= Tolerance B= Tol. +0.010/-0	 min. max. *Standard cross-sections (CS) listed and non-standard sizes can be provided for any shaft size up to 63 inches. Seal retaining plate for ressures above 7 psi recommended. Surface finish: Shaft (A) plunge ground, zero lead, Ra 8-16µin for rubber seal lip, Ra 6-12µin for PTFE seal lip. Housing (D,L) Ra 32-63µin, shaft material hardness 55-65RC. See Technical Info for more specific information. Size Table (Metric)Standard sizes listed below are preferred sizes for new design applications; however, we offer any other seal size as required. Seals are available for any shaft diameter size in 0.01 mm increments and in standard DIN 3760 sizes, including Functional Range. Standard Range Functional Range * D= B= Tol. +0.25/-0	 min. max. *Standard cross-sections (CS) listed and non-standard sizes can be provided for any shaft size up to 1600mm. 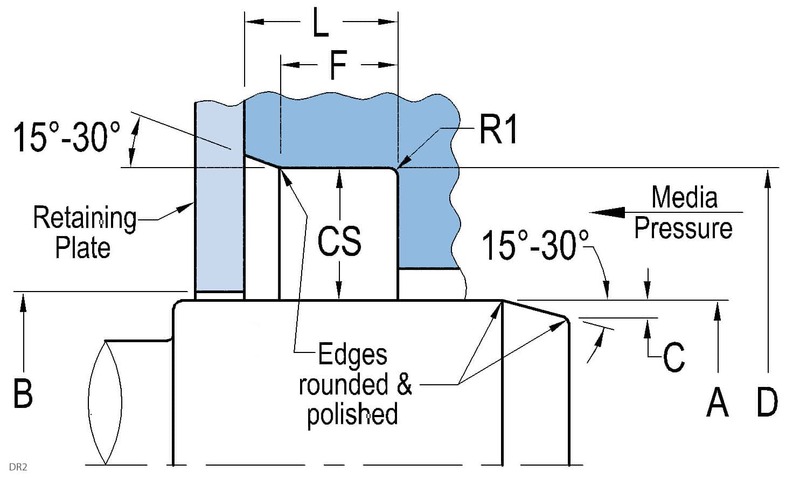 Seal retaining plate for pressures above 0.5 bar recommended. Surface finish: Shaft (A) plunge ground, zero lead, Ra 0.20-0.40µm for rubber seal lip - Ra 0.15-0.30µm for PTFE seal lip Housing (D,L) Ra 0.8-1.6µm. Shaft material hardness min. 55-65RC. See Technical Info for more specific information.